I can do everything you need to get your web site launched and promoted. Whether you're looking to get a bare bones web site up and going, or looking for all the bells and whistles, I have the tools to create you a web site you'll be proud of. I run my own servers and firewall in a secure facility. You can feel confident your data is safe. Ready to sell things online? No problem. My built in shopping cart software is perfect for you to sell your products online. Having a website is not always enough. People have to find it. I will work with you to generate copy that will help drive traffic to your website. My software comes complete with a bulk mailer. You can easily import your existing emai lists, or start creating new ones. You can see who you sent your messages to, and whether or not they read it. Facebook and Twitter are taking over the world, so become part of the network. Get signed up, make friends, generate followers, and let them know about your services on a regular basis. This is a great way to drive traffic, generate and retain customers. 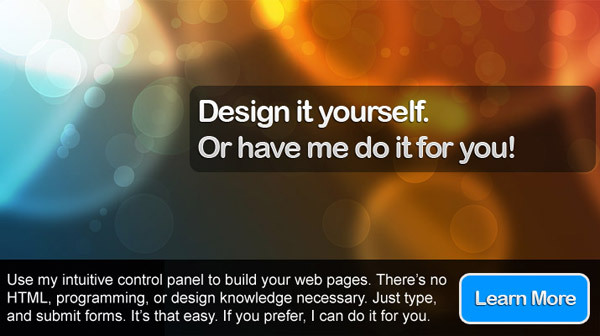 iBuildYourSite.com provides web hosting and web design services at an affordable price. Get a Free Custom Quote today! Follow us on Facebook to receive updates regarding network issues, discounts and more. 2019 © iBuildYourSite.com - All Rights Reserved.